How It’s New York: In addition to taking place at the Irish Arts Center, a hub of all things Irish in New York, the musicians include many who are New York based– including Mick Moloney himself, who teaches at NYU. This article was originally published in Irish Examiner USA. We still have ONE Cd to giveaway, email HAPPY HOLIDAYS to claim! STAY Tuned to hear Mick on this week’s podcast! “Irish Christmas” music has become as much a hallmark of the season as the ringing bells of Salvation Army Santas. Every Performance Arts Center is hosting someone, it seems. Since 2008, one of the nicest series in New York has been “An Irish Christmas” at Irish Arts Center (IAC), hosted by Mick Moloney. The concerts this year begin December 7th and run Wednesday – Sunday through the 18th. 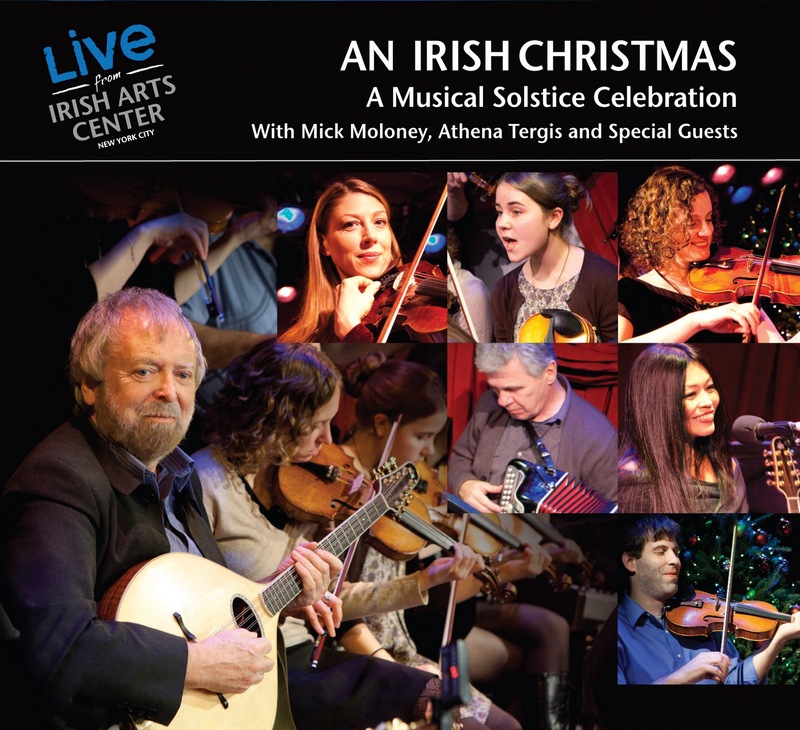 IAC and Mick have just released a live album from the concerts, “An Irish Christmas: A Musical Solstice Celebration,” and it’s a keeper. It’s the first live album Mick has ever done, and, he says, it’s become one of his favorites. Making a permanent record of the events was a logical thing to do, but he didn’t know he would enjoy listening to it so much. And then there’s the unfortgettable singing and chanting of Philipina singer Grace Nono, 3 -time winner of the Katha Best World Music Album. The blend of tunes, songs, and the sound of tapping feet from dancer Niall O’Leary convey the celebratory warmth of the events themselves. Often a Christmas album begins to feel exhausting; around track 9 you’ve just had enough – unless you’re using it as background music to a holiday party. “An Irish Christmas” is different; it has a flow and lilt to it that is like a live concert. While it is more than appropriate as background music, you might be tempted to shush everyone a little to bask in the sweetness of the sounds. Mick loves doing the concerts, and that joy really shows. The series always features Mick and a core group of Irish musicians, with guest musicians on different nights and non-musical guests who show up and do a “party piece,” and are interviewed by Mick. While the concerts and album are titled titled “Irish Christmas,” the world “Solstice” has always appeared. “There are pre-Christian songs.” That blend of Pagan, Christian and other cultures feels very Irish – as well as very festive. If you’ve ever been to one of Mick’s events, whether one of his Symphony Space extravaganzas like the “Tribute to Harrigan and Hart” this autumn, or the mid-week interviews in IAC’s “Masters in Collaboration” series, you’ll know that the NYU professor and NEA Heritage Award winner imparts a lot of knowledge in a conversational way. Doing the concerts at Irish Arts Center lifts Mick up. It’s a nice place to be. And the album takes you there.